Hotel Galvez Galveston: A Classic Texas Vacation Rental. 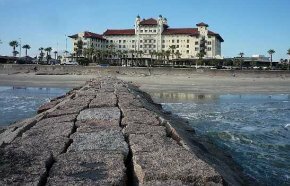 Hotel Galvez Galveston is the Queen of the Gulf among all hotels in Galveston. Galvez hotel is a class on its own. It was named after Bernado de Galvez who mapped out the Galveston Texas coastline. The hotel went through some turbulent times. Burnt down in 1898 and rebuilt in 1911 only to withstand great storms. A massive $9m renovation has restored it to its statusas the Queen of the Gulf. Hotel Galvez Galveston looks very European on both the outside and inside. It has a Victorian look that takes us a step back into time. The hotel itself is very inviting. It is situated right in front of the Stewart beach, the most crowded of all the Galveston beaches where the greatest fun activities take place. Right in front of the Hotel Galvez is the long pier from Galveston seawall into the sea. The Galveston hotel has a beautiful roofing at the lobby made up of dark Mahogany. The hotel rooms are are very excellent but small. Remember this was built in 1911. Alterations to the room will devalue its classic status. They are quite expensive, however it is worth living in a luxurious place like this once a while. Hotel Galvez Galveston is equipped with many modern amenities like fitness facility, spa and wireless internet access. A reminder, visitors might have to pay a fee anytime they log on wifi. Galveston attractions like the Moody Gardens, Schlitterbahn, museums and the Strand shopping centers are within 15 minutes drive. The tourist trolley from downtown passes by the hotel. 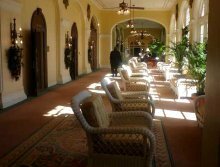 Galvez hotel is well known for hosting great banquet, parties, business meetings, church functions and other activities. This a perfect place for Galveston weddings. The atmosphere is set up for that. The tropical look and the whole architecture makes the hotel setting natural. Experience a relaxing and a more Caribbean tropical-like atmosphere at the breezy pool. This is a beautiful swimming pool area overlooking the sea. One can hear all the beach noise and the cars passing by. Well known to many vacationers, the famous Bernado's restaurant in the hotel serves traditional nouvelle cuisine regularly. There are some good Galveston restaurants and fast food places just around the corner on the seawall. The Millers Landing, Fishtale seafood restaurant, Salt grass and Dennys are within a short distance. Many of them serve real Texan foods. 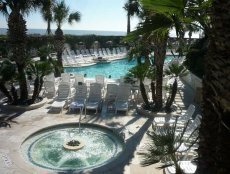 The Hotel Galvez Galveston is in a great location for holiday and beach lovers. It's close to the ferry that goes to Bolivar Island and not far from the ship channel. Once a while it is good to taste of a Victorian hotel setting like this. Room Rates 120 - 240 USD per night.